During the exchanges with researchers, we saw the need for a lot of laboratories to have their own microfabrication facility in order to make their own chips quickly and easily. This company propose a turnkey micro-fabrication station which enable any research lab to easily fabricate their microfluidic device without clean room. Those station enable to avoid the purchase and the maintenance of a clean room. Black Hole lab have been created to enable all research lab, whatever their field of research, to integrate microfluidic in their scientific work. They propose a wide range of equipment for microfluidic chip fabrication but we also provide training and scientific advise. 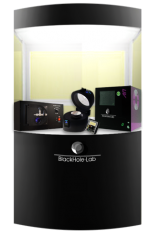 As part of the Microfluidic Innovation Center consortium Black Hole Lab can collaborate with your research laboratory to provide you featured micro- fabrication platform and microfluidic chips. Black Hole Lab web siteWhy choosing ELVESYS as a partner for your R&D consortium ?